We recently visited WinStar Farm in Versailles, KY. This is my first in a 3-part blog series. In this edition, I will look at the WinStar stallions. Part II takes a look at the horses in the Training Barn. In Part III, I will take a behind the scenes look at WinStar. Before discussing the sires, I have to mention Dullahan. Unfortunately, we were one of the last people to see Dullahan at WinStar. We saw him last Wednesday and were shocked to hear that he had to be put down due to colic less than four days later. I respect all of these amazing athletes, even when they cost me money. I needed Take charge Indy (also at WinStar) to finish 4th to cash my 2011 BC Juvenile superfecta, but along came Dullahan to nip me on the wire. I had no idea that Dullahan was rehabbing at WinStar and was pleasantly surprised to see him last week. He was a magnificent looking animal and will be missed. 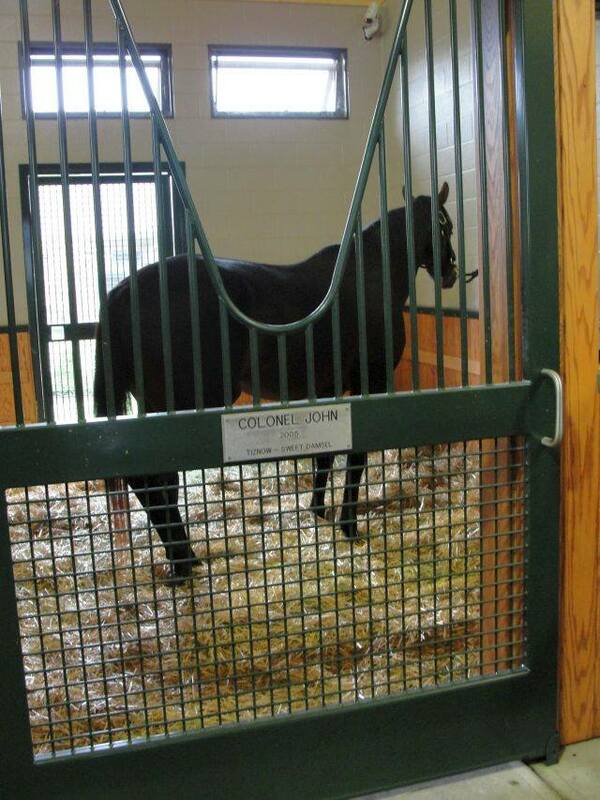 The WinStar stallions read like a who’s who of my losing Derby selections, beginning with Colonel John. Don’t worry big guy, you redeemed yourself in the Travers! Colonel John is off to a fast start at stud. He could run on anything and the versatile sort seems to be passing that valuable trait to his offspring. Oh, look who’s right across from Colonel John. It’s my Kentucky Derby 2008 losing pick Pioneerof The Nile. The latter is a feisty one and reportedly tried to bite someone recently. Don’t turn your back on this one! He seemed a bit keyed up on Wednesday and is ready for the upcoming breeding season. Pioneerof The Nile was dusted by one of the most unlikely Derby winners of all time, Mine That Bird. Earlier this year, it was fun to see Mine That Bird frolic with energetic miniature horse Winston at the Kentucky Derby Museum at Churchill Downs. 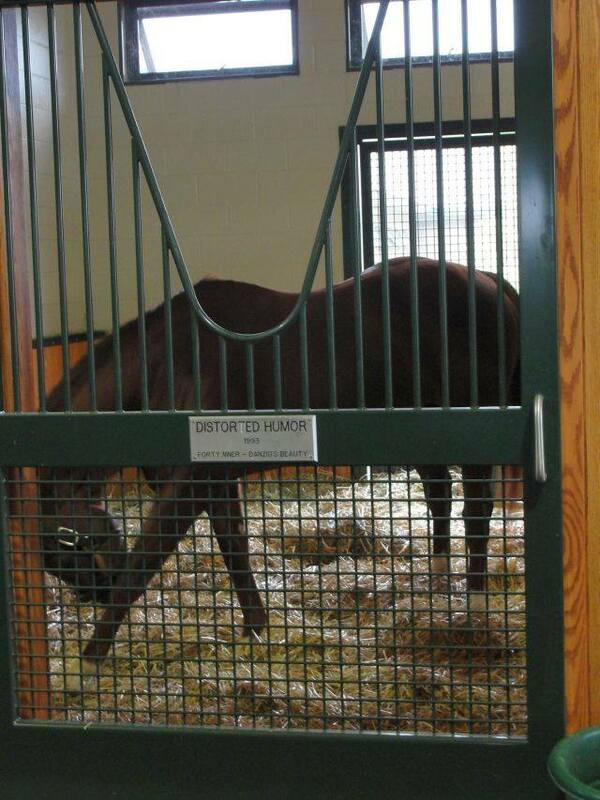 Distorted Humor put WinStar on the map, siring the likes of Drosselmeyer, Funny Cide, and Flower Alley. Distorted Humor laid the foundation and paved the way for 2-time Breeders’ Cup Classic hero Tiznow, who might be the most popular stallion on the magnificent grounds. Colonel John’s papa is also responsible for Well Armed, Tizway, and fellow WinStar stud Gemologist. Tiznow beat me in the 2001 BC Classic. I was at Belmont Park that day, and the tragic memories of 911 were fresh in everyone’s mind. In a surreal world, snipers were perched on the roof, and the crowd got lost in the moment when Tiznow turned back Sakhee to win one for America. Other stallions at WinStar that we got to spend some time with include Bellamy Road, Bodemeister, Gemologist, Hold Me Back, Kodiak Kowboy, Maimonides, Speightstown, Spring at Last, Street Hero, Super Saver, and U.S. Ranger. We were told that Bodemeister does not care about his appearance – typical dude! Maimondes is very sweet and and owns an outstanding pedigree but is the forgotten sire standing for a mere $2,500. Thank you to WinStar for allowing us to visit and for taking us behind the scenes. 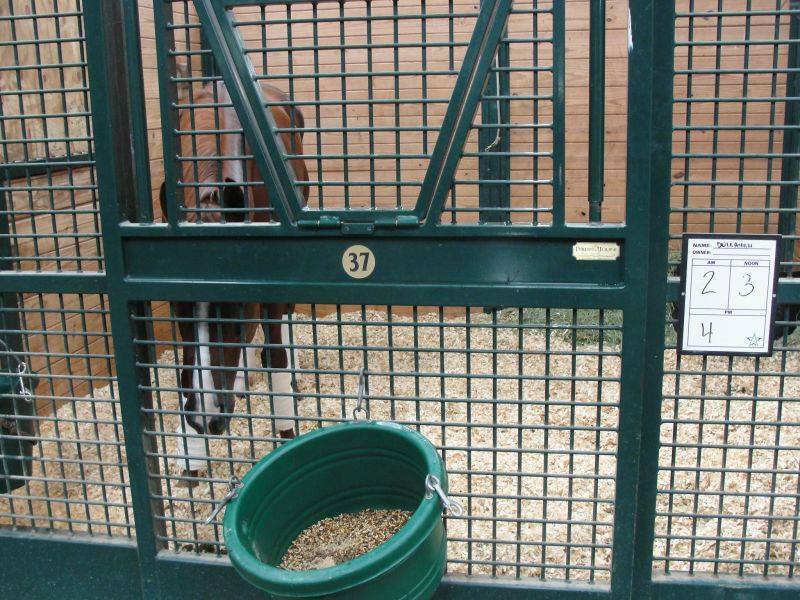 If you would like to learn more about the WinStar StableMates program, check out their website. If you would like to see more of Stacy’s WinStar photos, please visit her Kentucky horse racing photos page, The Runaway Horse.